I hope those who are on the East coast are staying warm and safe in their homes tonight as blizzard Nemo rages. I heard it's suppose to be the worst blizzard ever and I've seen and heard some amazing details about it already. I hope it's not as bad as hurricane Sandy. My thoughts are with you guys this weekend. 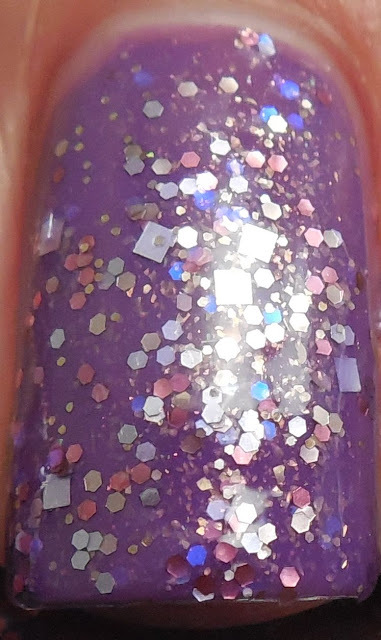 Tonight I have another one of Hare's fall release polish called Amethystos from The Finder's Keepers collection. This is a gorgeous glitter bomb in a sheer purple jelly base, and it contains a multitude of purple, pink, and silver glitters in a multitude of shapes and sizes. I was able to use two layers on its own to get opacity despite the base being sheer - the glitter is dense enough to cover the nail thoroughly. 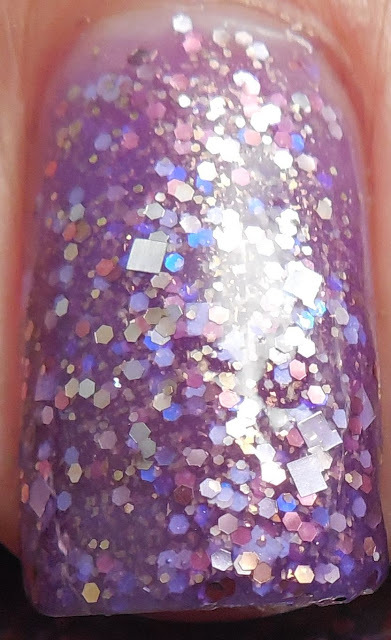 Despite being packed full of glitter, I had no problem with application, the polish slid onto the nail smoothly and easily with no dragging, as long as I waited for each layer to dry thoroughly before adding the next. I used a layer of Gelous to smooth it out and finished with SH Insta Dri. I also tried this over Butter London Scoundrel to see if I could achieve a more layered look rather than a dense glitter when worn alone. This is one coat of Amethystos over two layers of Scoundrel, finished with only a layer of SH Insta Dri. The glitter is more subdued when worn with BL, but I think I like it when worn by itself better because I love to see depth in a polish, and there's plenty of that in the glitter only variation. How would you wear this polish, alone or over a particular colored base?